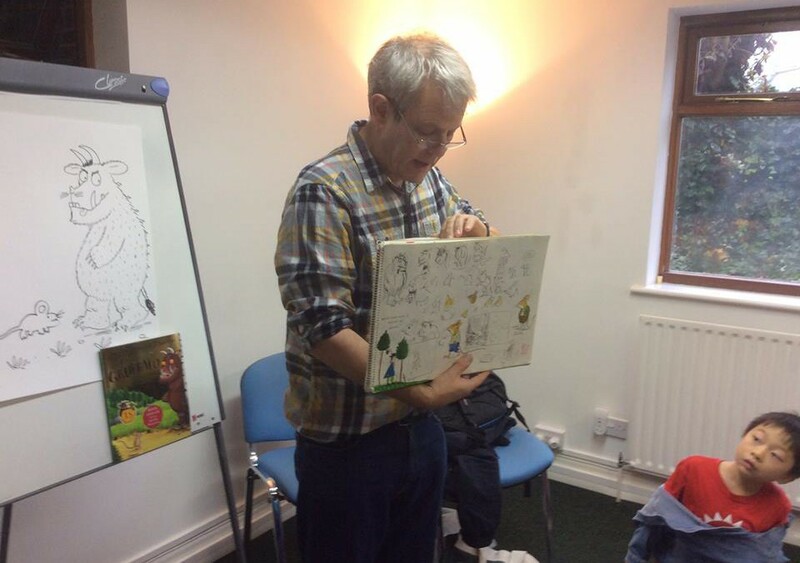 On Saturday 22nd November, Art Room Brighton was extremely pleased and honoured to have another very special guest visitor: Axel Scheffler, the illustrator behind the wonderful artwork of classic children’s stories, ‘The Gruffalo’, ‘Room on the Broom’, ‘Zog’ and ‘The Snail & the Whale’, to name but a few. Mr Scheffler’s long partnership with writer Julia Donaldson has made him one of the most popular children’s illustrators of the last 20 years, so we weren’t surprised when the turnout of pupils who jumped at the chance to meet him was extremely high. The room was filled with excitement as our VIP speaker began his talk with a detailed explanation of howhe came up with the look of the Gruffalo, including a privileged peek inside the genuine sketchbook containing his first ever outlines of the fabulous beastie, drawn some fifteen years ago. Originally thought to be too scary for use, all of our children agreed they were brilliant and offered an amazing insight into the creative process when compared to the final Gruffalo we all know and love. Mr Scheffler rounded off his talk with an exuberant reading of two of his books – ‘The Gruffalo’ and ‘Zog’ – followed by a Q&A with the children, who proved to have an excellent array of insightful questions, all of which delighted our guest. While for one pupil – Zoe Clark – the afternoon was even more special when she was invited up “on stage” to contribute her own handiwork to an original Axel Scheffler drawing! As expected the queue of children and parents who waited behind to have their books signed by Mr Scheffler (with a unique drawing too) was long, so thanks to all of them for their patience, which insured the whole event went off without a hitch and was a great success!